Home › History › How did you watch television? How did you watch television? As I explained that we didn’t have television, and saw the pitying look in their eyes, I realised that I had witnessed the end of a way of life that had disappeared forever and that maybe it would be a good idea to get down on paper the memories of the people who lived through it. 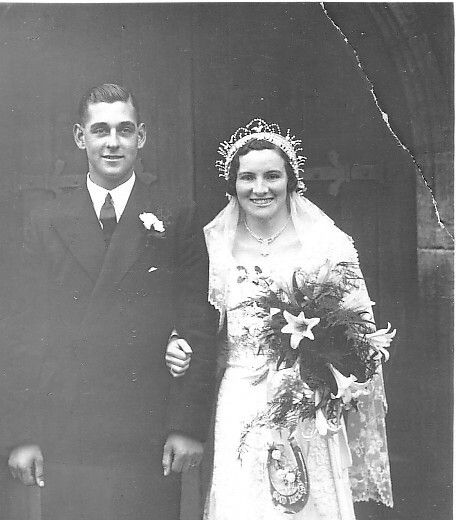 Fortunately my mum and dad, Elsie and Jack Coomber (pictured on their wedding day in 1936), lived into their 90s so I was able to sit down with them and record their stories and you can read most of the result here. Someone in the village said it would be a good idea if I extended my efforts and wrote a history of the village. No problem, I said. But when I started to do the research, I realised I didn’t have a clue how to go about it. So I signed up for an online course at Oxford. I was studying again 40 years after leaving school. And studying history, a subject I’d hated at school – all those dates, kings and battles – and abandoned as soon as I was able. But this was local history and it came alive. It was about real people and places and how history had changed everyday lives. I was nearly 60 and suddenly hooked on history. I loved the research and my journalism background meant writing essays was no problem. I wanted more. Fortunately, the tutors at Oxford steered me towards the University of Leeds who then ran a part-time degree course in local and regional history. I couldn’t sign up quickly enough and was fortunate to meet a great bunch of fellow students and to be taught by a series of inspirational tutors, most especially Cyril Pearce, Jonathan Tummons and for the last three years as the University lost faith with local history and taught out the course, the brilliant Alan Petford, a man who just loves sharing his vast knowledge. So, after a somewhat extended ‘gap year’ between school and uni, and six years part-time study, I finally had my degree. My life had changed completely. Most of my time is now spent researching local history in some form or other. One of my remaining ambitions is to write a piece of local history that will turn up in a bibliography in 100 years time. And all because I didn’t have electricity when I was a kid.